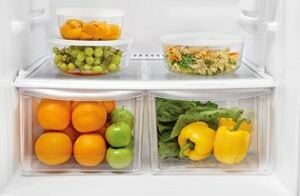 What to Store in Refrigerator Drawers | Tiger Mechanical. This blog will save you money by helping extend the life of your fruits and veggies! Have you ever asked yourself, “What produce should I store in the refrigerator drawers?” Well, you’re not alone. 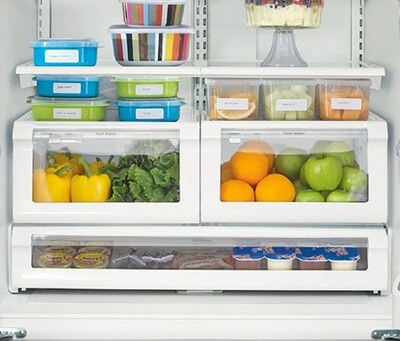 Many people use the refrigerator drawers as a way to organize food without understanding the drawer’s actual purpose. Are you guilty of haphazardly throwing your fruits and veggies in the drawer however you can get them to fit? If so, before you make your next grocery run, learn how to properly store produce so your fruits and veggies don’t get ripe, mealy, or spoiled too fast. What Goes in the High Humidity Drawers? The high humidity drawer is used for foods that wilt (like lettuce, spinach, and kale) and foods that are sensitive to ethylene gas (like strawberries, broccoli, and carrots). What does ethylene-sensitive mean? Some produce releases ethylene gas, which can cause food stored near it to rot faster. Foods that are sensitive to ethylene include apples, asparagus, broccoli, carrots, cucumbers, eggplants, green beans, lettuce & greens, potatoes, squash, and watermelons. These fruits and veggies should be stored away from produce that emits ethylene gas (you’ll store the gas emitting produce in your low humidity drawer). When storing items in the high humidity refrigerator drawer, turn the Humidity Control lever to “high.” This closes the window, which will keep moisture in. Use the low humidity drawer for produce that emits ethylene gas, like apples and pears. Letting the ethylene escape from the drawer allows food to stay fresher longer and prevents it from rotting before you get a chance to eat it. When storing items in the low humidity drawer, push the lever toward the “low” setting. This will open the window allowing the ethylene gas and moisture to escape (keeping your food fresher longer). Here is a list of common fruits and vegetables to keep in this drawer. Don’t think you can remember what goes where? Try using a label maker to list some of the more common produce you eat right on the front of your refrigerator drawers. Final tip: When buying food, remember to buy only enough to fill the drawers up two-thirds. If you overstuff the refrigerator draw, you could block the window for the ethylene gas to escape.